The Fiddlehead’s 28th annual literary contest is now closed! Thanks so much to everyone who entered. Our judges had a difficult time in choosing from the many excellent submissions! Contest winners and honourable mentions have now been contacted. Other entrants can now send their work elsewhere. Authors’ names and the titles of the works that made the longlist of 15 in both categories will appear on The Fiddlehead’s website in early March 2019. The shortlists will appear in early April 2019. 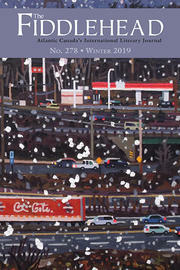 The winning entries and honourable mentions are published in The Fiddlehead’s spring 2019 issue and on our website. Authors are paid for publication in addition to their contest prizes. $2000 CAD for Best Creative Nonfiction Essay! Good luck to all entrants. Since June 1 falls on a Saturday, this year's contest deadline is Monday, June 3, 2019 (postmarked for mailed entries and 11:59 pm Atlantic Standard Time for Submittable entries). Award-winning author Marcello Di Cintio is our judge! In his most recent book, Pay No Heed to the Rockets: Palestine in the Present Tense, Calgary author and journalist Marcello Di Cintio explores life in contemporary Palestine as seen through the lens of Palestinian literary culture. His previous book, Walls: Travels Along the Barricades won the 2013 Shaughnessy Cohen Prize for Political Writing. • Entries must be original and unpublished. No simultaneous submissions and no previously published (or accepted for publication) submissions. This means that an entry must not be under consideration elsewhere for publication, nor accepted elsewhere for publication, nor entered in any other contest. Work that has appeared on the internet (e.g., online magazines, blogs, or social media sites) is considered published for the purposes of this contest and is ineligible. • An entry must be the original work of the person who is submitting it and the name and contact information provided must be the author’s. Contest entries should be submitted under the author’s real name. If you use a pseudonym for your published works, you will have a chance to inform the editor of this should your work be selected by the judges. • All entries must be submitted by mail or via Submittable. This year's contest deadline is Monday, June 3, 2019 (postmarked for mailed entries and before June 3, 11:59 pm Atlantic Standard Time for Submittable entries ). No faxed or emailed submissions are allowed. Click below to access our Submittable page. If you don’t already have a Submittable account, you will be prompted to sign up for one before you submit. It is free and it only takes a few minutes.